Below, in the next section, is description on how the book and North Shore Animal League America were put together and how the donation works. 2) If you already have an amazon.com password, log in . If not set up an account. Its free. 5) shop for what you would like to purchase. In this case Search for “Loves Garfield Book”. The fastest way is to search for “Cathy Kothe” and the book will come up. Note: each time you shop on amazon.com for anything remember to go to smile.amazon.com for North Shore Animal League America to get a donation. Sign up to receive your copy of "Loves Garfield"
This page is to explain the relationship between the Loves Garfield book and North Shore Animal League America. First of all, both companies are completely separate entities. North Shore Animal League America is a Not-for-profit organization who is the largest no-kill shelter in the world. 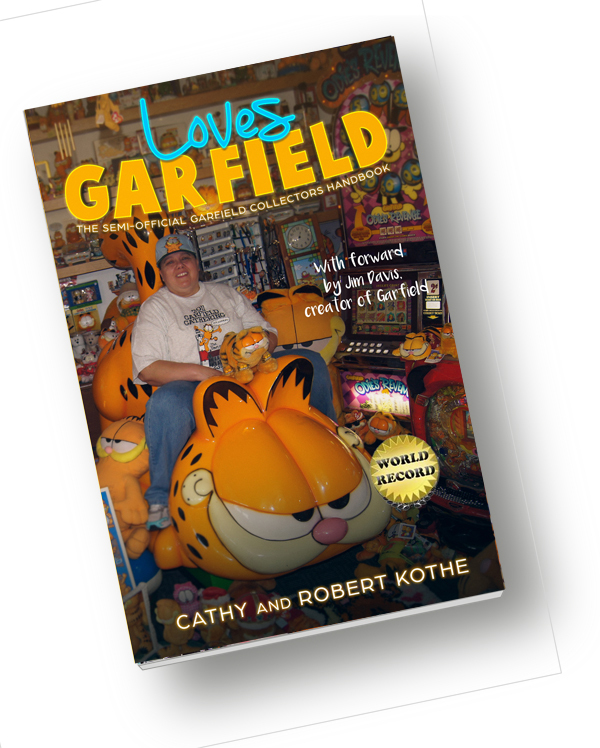 “Loves Garfield” is a for-profit book project written by the World Record Holder for Garfield collectibles and her husband, Robert. It is published by another separate company, Red Penguin Books. CLICK HERE to learn more about your rights and any relationships that may or may not exist when working with us or other Real Estate professionals. Cathy and Robert Kothe the authors of Loves Garfield have been fostering dogs for North Shore Animal League America for over four years so far. To date, they have fostered over 40 dogs and counting. Cathy and Robert specialize in smaller dogs with troubled pasts such as puppy-mill-dogs, post-operative cases, un-socialized dogs, and even a hospice dog who was dying of cancer. Don’t feel bad for him he had a great year of tasty table scraps, nice walks, love and absolutely no discipline. Robert and Cathy are terrible trainers. If that is not enough connection, all of Cathy and Robert’s previous dogs as a married couple have been rescued from NSAL. Sweetie and Oreo were their first two and Zeta was their first foster dog that they adopted. Robert and Cathy also have helped as Volunteer delegates of NSAL to help represent the foster program. They have staffed the first Walk-and-Wag and Robert even professionally filmed it for NSAL. They have volunteered at Adopt-a-thon and staffed the foster table and even the cotton candy machine. They have assisted in teaching new foster orientations and even puppy-mill classes. In 2015, Cathy and Robert were recognized as the “Foster of the Year” for North Shore Animal League America. Put simply. Since Robert, Cathy and Red Penguin Books are choosing to donate a minimum of 5% of their profits, we want to share that we hope that this turns out to be a lot of money, but it does not constitute a formal or official relationship or strategic alliance. We simply have a favorite charity that we want to give some money to. The money that goes to NSALA can increase if books are also purchased through their affiliate link or sold directly from their facility acting as a book seller. No matter what, a minimum of 5% of our profits will go to NSALA for ever book sold. North Shore Animal League America is happy with being named benefactor, happy to give the book opportunities to be seen but they like people to know that we are simply great volunteers who approached them to be the benefactor of the donations. We are proud to be volunteer spokes people for the mission to rescue shelter pets. Paws, Inc., the Garfield people, owned by Jim Davis, the creator of Garfield, was gracious enough to waive the royalties to the Loves Garfield book. We thanked them and suggested that we donate some of the profits to North Shore Animal League and they were happy to agree. Jim Davis even mentioned North Shore Animal League in the book forward, so I guess we are officially committed. Paws, Inc. is (or has been) involved with “The Shelter Project”. Their mission is for people to adopt from shelters, so this book project is perfectly aligned with that mission. We hope this project not only brings in a decent donation to North Shore Animal League America but also continues to provide awareness to the plight of cats and dogs and kittens in puppies in overcrowded shelters. Cathy and Robert, Penguin Books, and Paws, Inc. are happy to support such a worthy cause. Every time Cathy and Robert do a book signing or public appearance, they designed the presentation closing to bring up NSALA and to spread the word about the good work that they do. Thank you in advance for being a part of this dynamic and hopefully buying a book, using a NSALA affiliate link or even attending live events. Together we can make euthanizing so many animals unnecessary.